Meet Lindy! Lindy is 7″ tall and sculpted in air-dry LaDoll Premiere clay. She’s painted in acrylic paint and sealed with a matt finish acrylic spray. I sculpted this bust in a two-day class with Australian artist, Linda Misa Linda Misa’s Blog . The class was hosted by another doll maker who opened her home to us for 2 days of friendship and creativity. 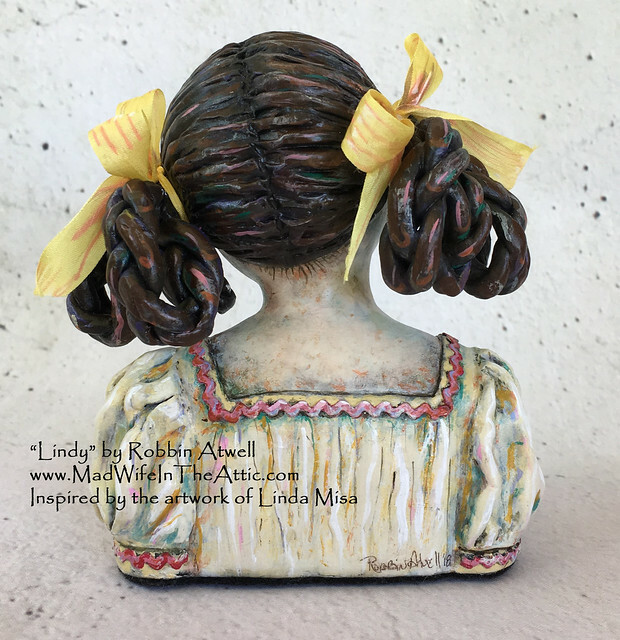 Linda is a very accomplished painter and doll artist. As a teacher, she’s patient and very generous with information. Everyone in the class sculpted and painted at a different level which must be a real challenge for a teacher. Linda helped each person as much or as little as they wanted. 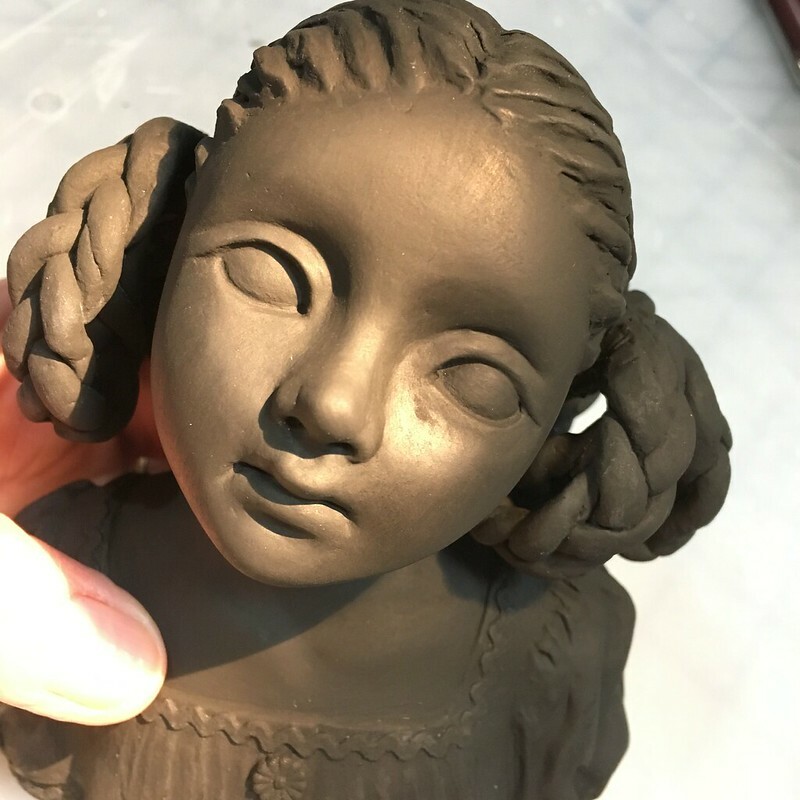 We started by pressing soft clay into one of Linda’s face molds to give us a head start with a basic face that we could modify. We then built the back of the head and shoulders with clay over a foil and Styrofoam armature. I forgot to take pictures while I worked, but this is Lindy once she was sculpted. 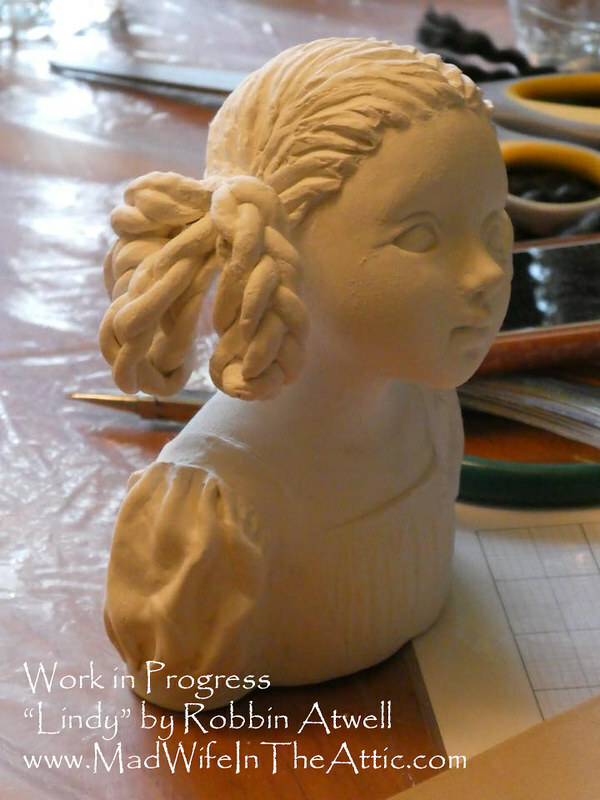 I particularly enjoyed sculpting her hair. She was then coated with black gesso to prepare for her final painting. 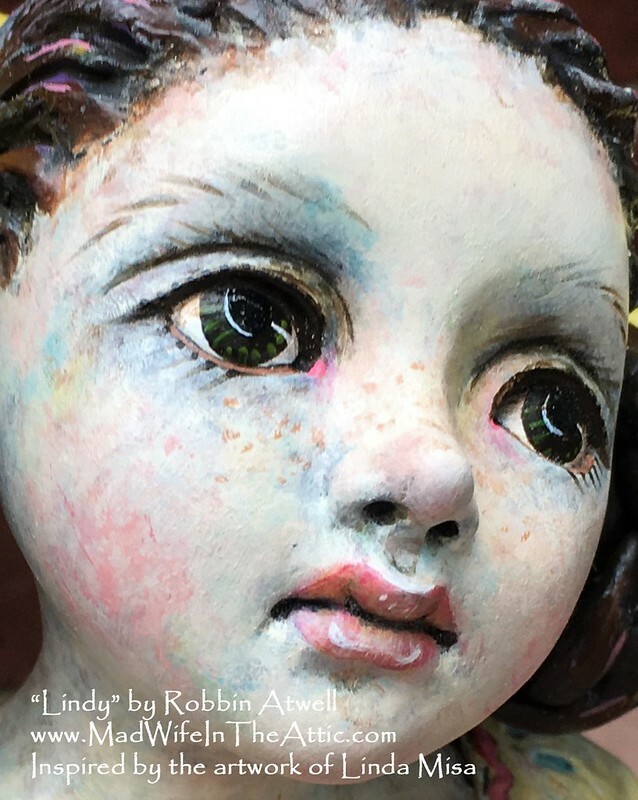 Lindy was painted with high quality artist paints and sealed with a matte spray. I tried to paint her in Linda’s colorful, expressive style. You can add things to the wet clay and when it is all painted, it’s incorporated into the sculpture. I used real ric-rac and buttons on the sculpture’s blouse. 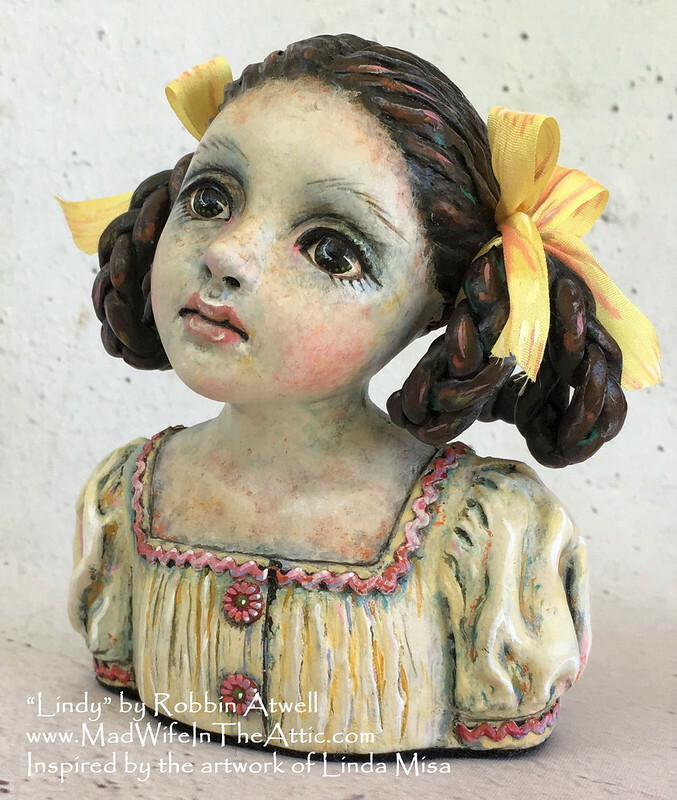 As a last note, a beautiful doll by Linda Misa happens to be included in the Summer 2018 issue of “Art Doll Quarterly.” This issue is especially good–look for it! 01 Jul	This entry was published on July 1, 2018 at 6:38 pm. It’s filed under Doll Making, Sculpture, Tips and tagged Classes, clay, Crafts, Dolls, LaDoll, LInda Misa, Painting, Sculpture, Tips. Bookmark the permalink. Follow any comments here with the RSS feed for this post.